Here is a little video showing Patti’s new Hobie Revo 16 sailing in South Padre Island, Texas. Just thought you might like to see how we rigged her up. 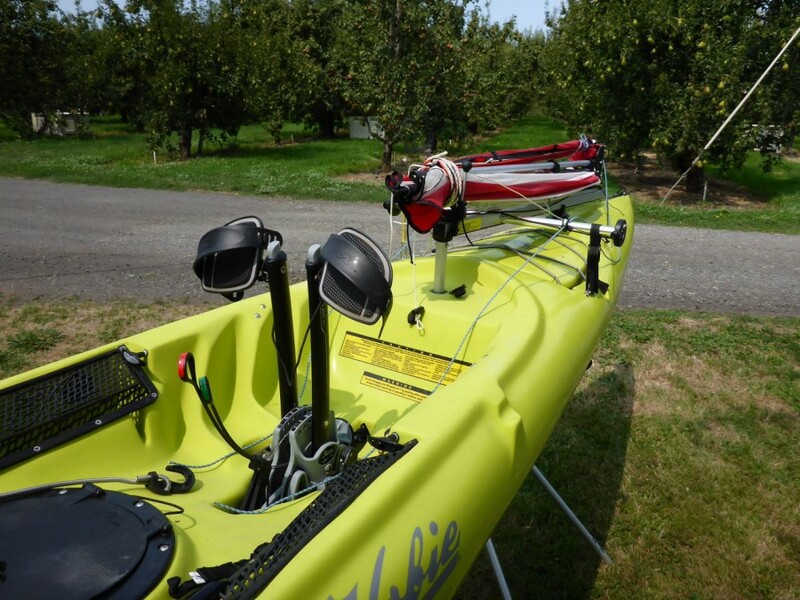 She’s a lime green Hobie Revolution 16 pedal driven kayak. 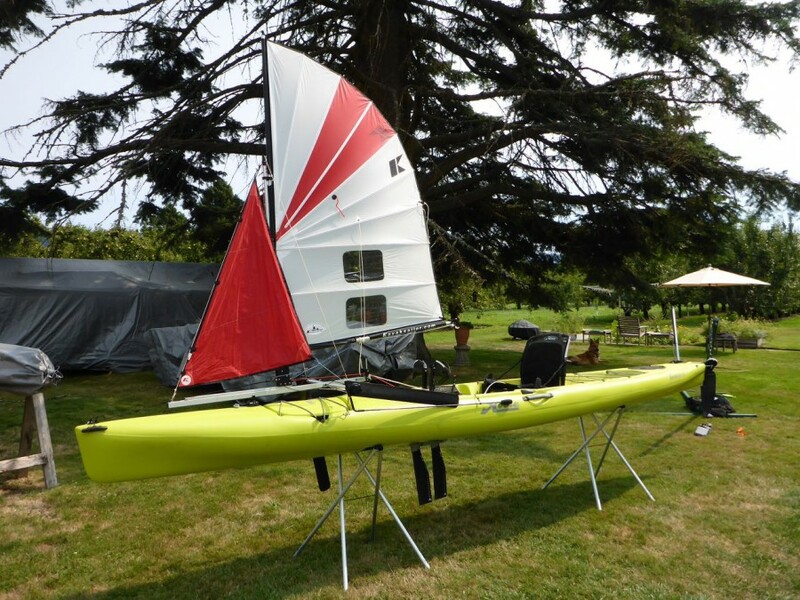 Basically a Hobie Mirage Adventure Island sailing kayak, minus the outriggers, daggerboard and large sail rig. She is a good looking hull with a long, speedy waterline, a fine entry and a decent amount of stability. Not as stable as many wide, fishing specific sit-on-tops, but has better top-end speeds. Probably the main selling point was the cool new Mirage 180 pedal drive. This upgraded drive allows reverse propulsion with the pull of either short red or green cable at the base of the pedal stalks. Amazingly the flippers underneath rotate 180 degrees on their shafts. The whole mechanism is brilliantly designed, works flawlessly and provides remarkable speeds. Kudos to the engineer/s. For increased speeds we upgraded to the larger Turbo fins. In our minds, this boat should come standard with the turbo fins. We also opted for the larger rudder blade, again, this probably should come standard on this model. We took advantage of the boat’s existing mast step hole to raise up the aft end of the rig to allow for un-obstructed peddling. 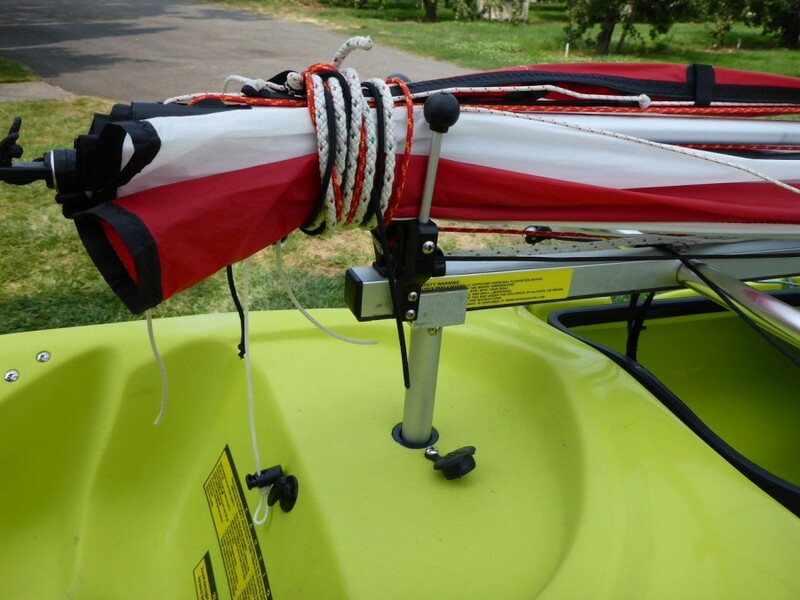 We used a short piece of aluminum tube, cut it to the proper height and attached a RailBlaza/Kayaksailor front channel mount to the top. Nice and clean! For the front we used a RailBlaza Star Base and inserted a Star Port Adapter with a Kayaksailor Micro Channel Block attached. 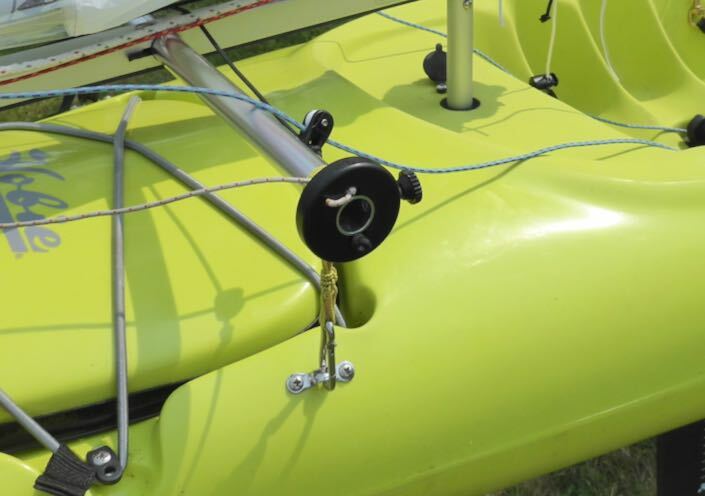 We installed a stainless pad-eye under teach end of the cross tube and lashed a small stainless snap shackle to the port side for ease of attachment. 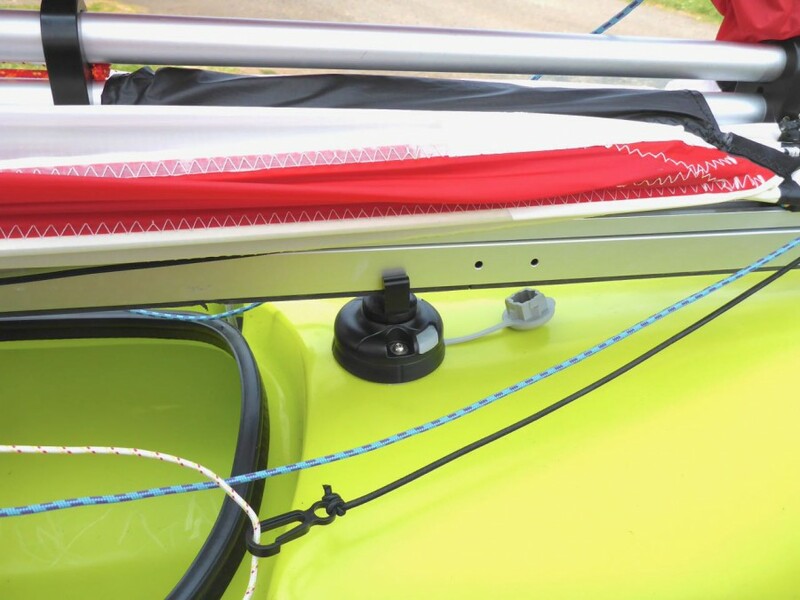 For the starboard side we used the webbing strap with the micro cam-lock buckle for speedy tension adjustment. To keep the mainsheet accessible and freely running, we suspend it above the drive mechanism by simply attaching a small diameter bungee between the pedals. Turns out the convenient rubber webbing pockets just inside the gunnels are perfect for holding the halyard and mast car control line. Patti really loves her new ride. If you are thinking of buying this model boat, we have included a short list of what we believe are important features to help you understand the boat better. First lets start with the less desirable features. 1. Compared to other plastic kayaks it’s pretty pricey, especially for a roto-molded polyethylene hull. Plus, the upgrades like the larger rudder, Turbo fins and Mirage drive leash add to the overall cost. 2. She is pretty heavy. At least compared to most thermo-formed or composite boats. It takes strong muscles and a good back to safely get her up on racks. A wheeled kayak cart is a must for transport. Also, care must be taken not to store the boat for extended periods on the cart as this can distort the relatively soft polyethylene. 3. 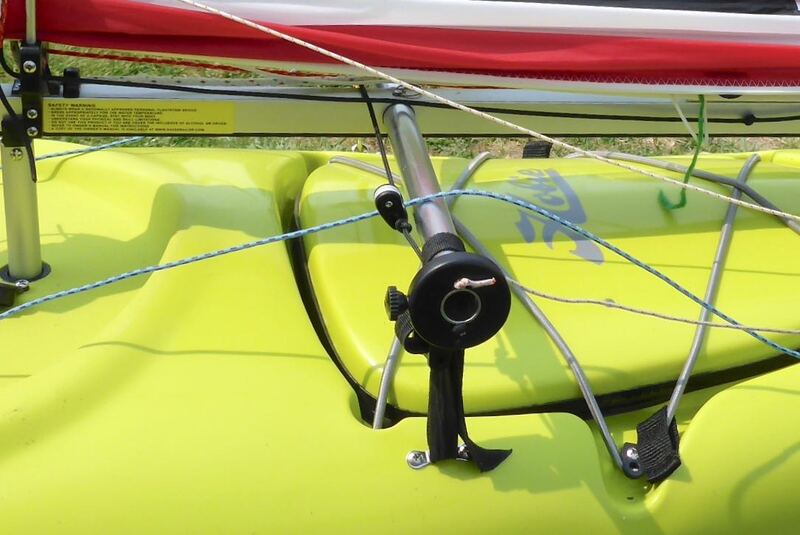 With the pedal drive, the kayak’s rudder is controlled by rotating a small knob-like tiller on the port gunnel. 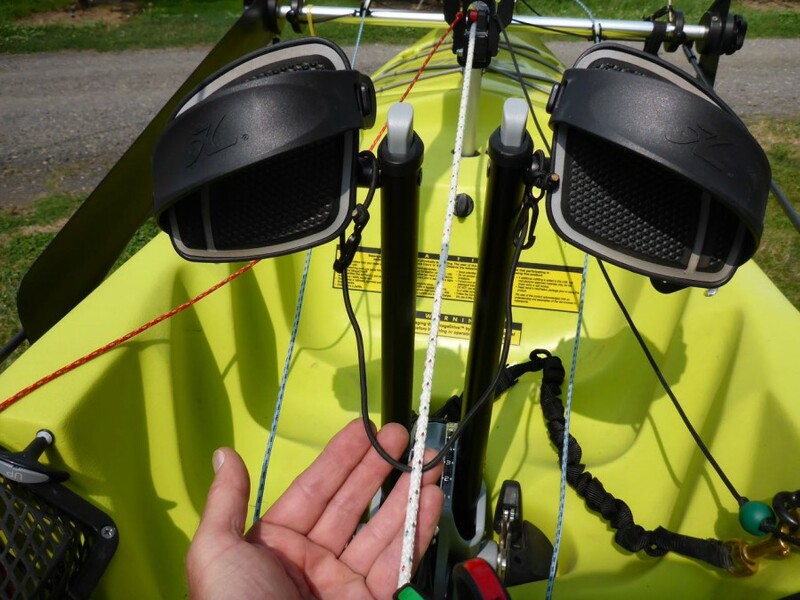 While it works well when peddling, when using the kayak paddle it’s difficult to operate the tiller as it requires the left hand to be removed from the paddle shaft. 4. We noticed that when sailing and not peddling at the same time, the Mirage drive added a noticeable amount of underwater drag. Yes, you can always remove the drive on-the-fly, but it’s ever so convenient to have it at the ready. Now for the positives. Wow… so many to list. 1. The drive mechanism. Again, the engineering is brilliant and it works amazingly well. 3. 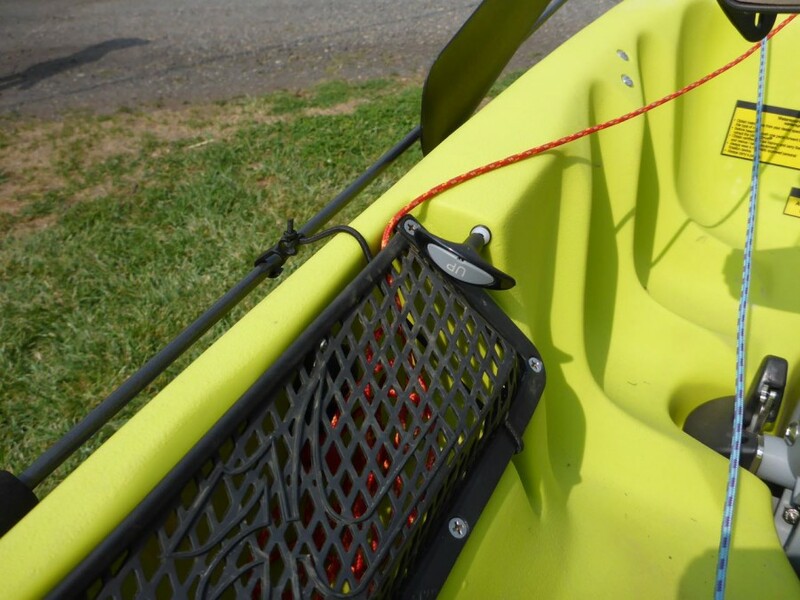 For a roto-molded poly kayak, the fit and finish of Patti’s boat is excellent. 4. The Revo appears to be very durable and should take quite a bit of abuse. 5. There’s a ton of usable storage space for gear, and pets! 6. I guess what impresses us most is how fast and fun this boat is to use. The combination of the long waterline, slender shape and Mirage Drive efficiency allows this somewhat heavy, recreational kayak, to simply go fast. 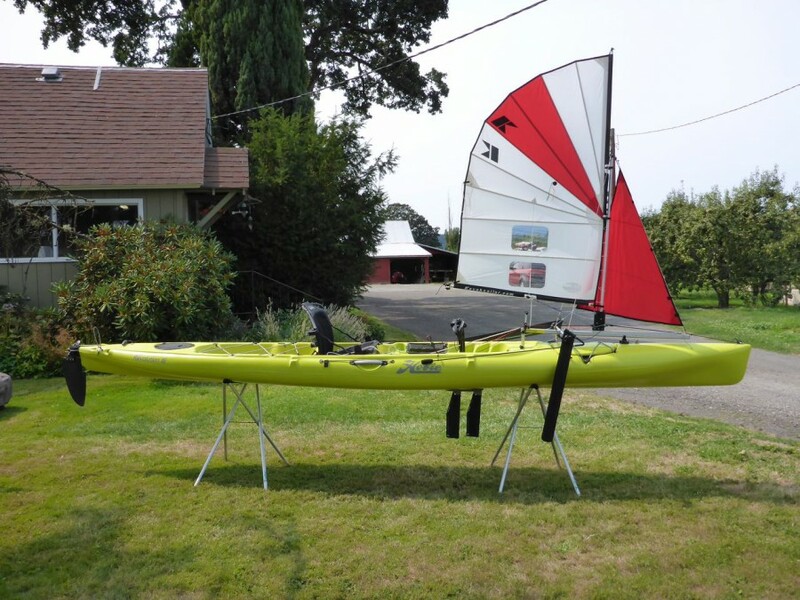 The Hobie Revolution 16 easily keeps up with most sea kayaks, and that is truly impressive.